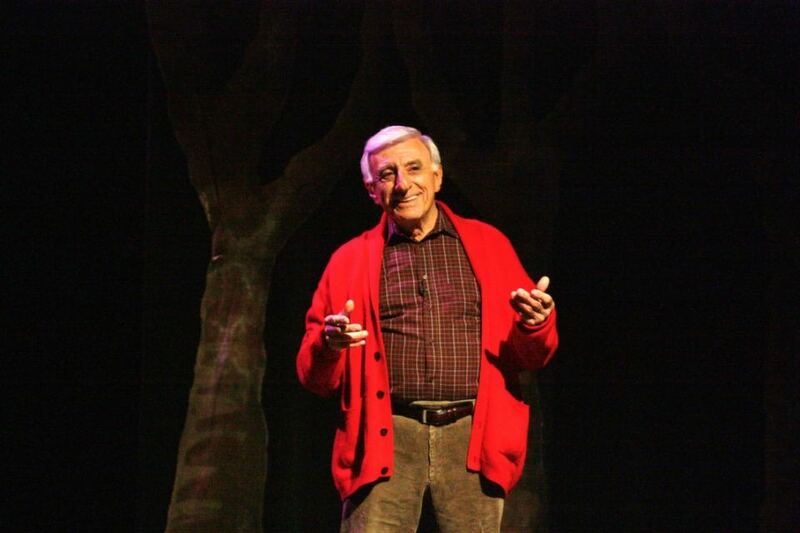 JAMIE FARR (Morrie) was born Jameel Joseph Farah on July 1, 1934, in Toledo, Ohio, the only son of Samuel, a meat cutter/grocer, and Jamelia, a seamstress. His acting career began at age 11 when Jamie won $2 in a local talent contest. He graduated from Woodward High with honors and was named most outstanding student, having served as class president for three years. He also wrote and acted in two variety shows, was editor of his school paper, president of the Radio Club, and manager of the football and basketball teams. He became a member of the National Honor Society, and after graduation he moved with his family to Southern California where he attended the Pasadena Playhouse. He won his first film role as Santini in THE BLACKBOARD JUNGLE, then served two years in the army in Korea and Japan. He then proceeded to carve out a TV career by appearing as a regular on THE RED SKELTON SHOW and several episodes of THE DANNY KAYE as well as THE CHICAGO TEDDY BEARS series. During the first season of M*A*S*H Jamie was hired for one day’s work as a phony transvestite bucking for a section 8 discharge. Something about the chomped cigar under the veil and hairy legs under the flowing skirt and the hooknose immediately clicked with the producers. Jamie became a full member of the cast of the No.1 show on television, playing Corporal Klinger and having even directed several episodes. The weekly show could boast of an amazing audience of 32 million regular viewers, running for eleven years, and was chosen by TV guide as the best television show of all time. The final two and a half hour episode aired February 28, 1983, drawing more than 125 million viewers, a record that may never be broken. He also has appeared on the big screen in George Stevens’ monumental THE GREATEST STORY EVER TOLD and with Burt Reynolds in CANNONBALL RUN and CANNONBALL RUN II. He has toured with John Davidson in WILL ROGERS’S FOLLIES and played Oscar Madison in the national tour of THE ODD COUPLE with his M*A*S*H associate, William Christopher. Jamie’s Broadway debut was made in the long running GUYS AND DOLLS for which he received rave reviews for his portrayal of Nathan Detroit. 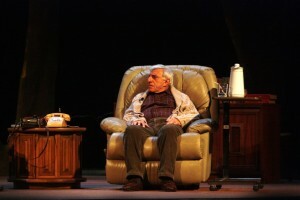 More recently, he appeared in MOON OVER BUFFALO, as well as the comedy-thriller play, CATCH ME IF YOU CAN. Jamie is still hoping to get back on a successful TV series and we all hope it will be soon. 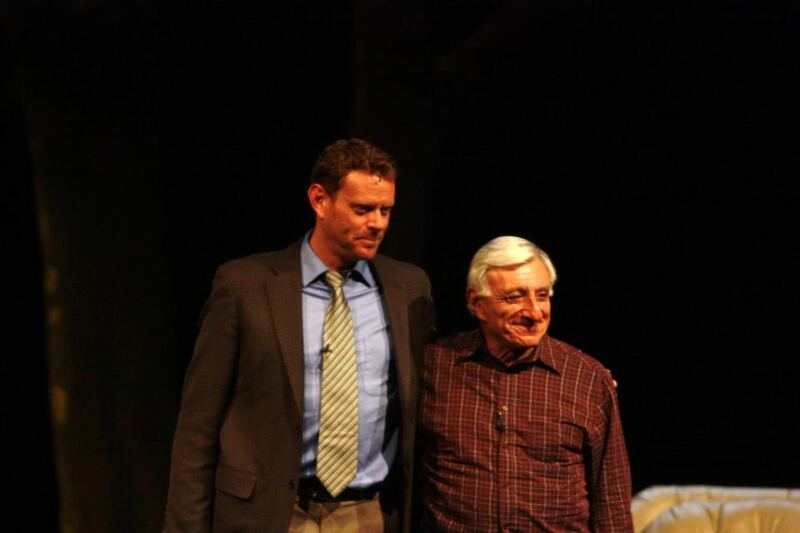 One of his proudest accomplishments was in 1985 when he received a Star on the Hollywood Walk of Fame and, of course, his Emmy nomination for M*A*S*H. And in 1983 Jamie received an honorary Doctor of Performing Arts Degree from the University of Toledo. 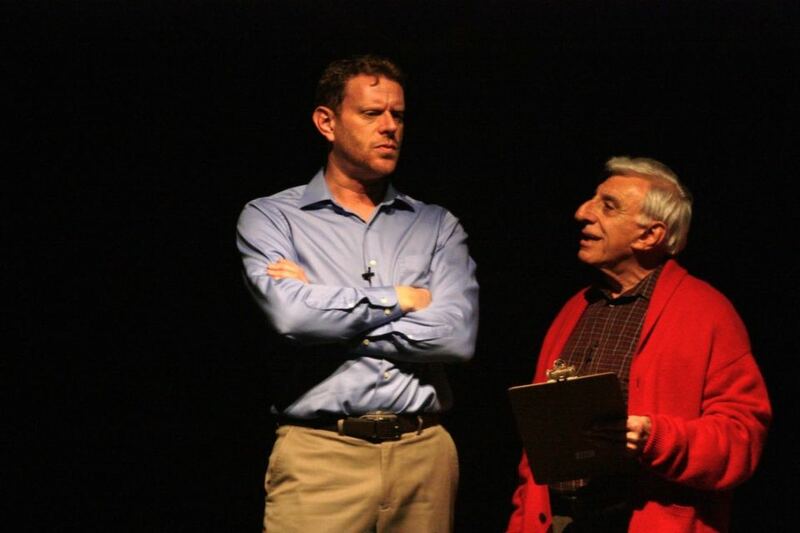 Jamie’s greatest passion aside from acting is golf and, as everyone knows by now, he has for over twenty years sponsored the nationally acclaimed Jamie Farr Owens Corning Classic. Morgan Sills is bringing great shows – and great actors – home from New York. Sills chose A.R. 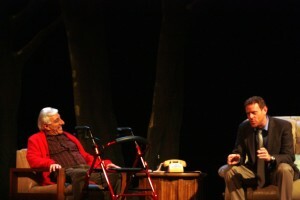 Gurney’s “Love Letters” as Judson Theatre Company opener, and what a show it was! Deceptively simple (two actors reading at a table) it quickly grew deeper and more profound with Tab Hunter and Joyce DeWitt (“Threes Company”) weaving a complex narrative web in two acts. 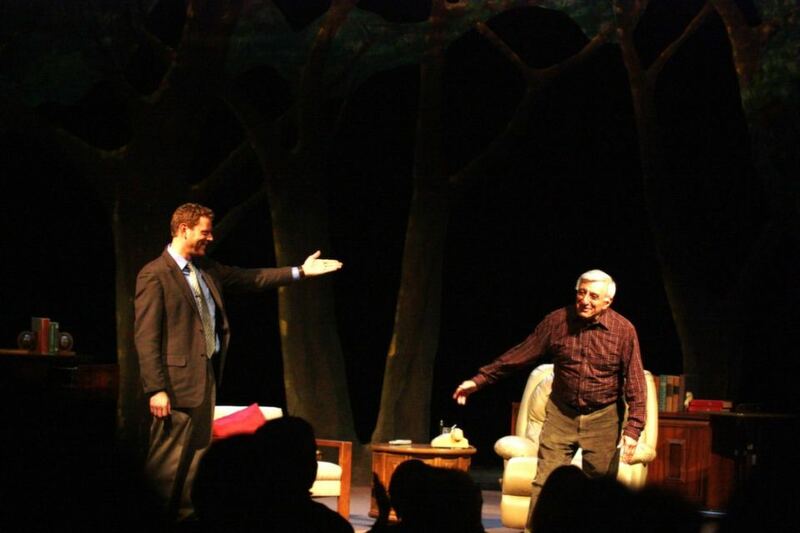 His second offering is another great show, and two more wonderful actors in “Tuesdays with Morrie.” This is a full production with sets and properties that show what can be done on the Sandhills stage. 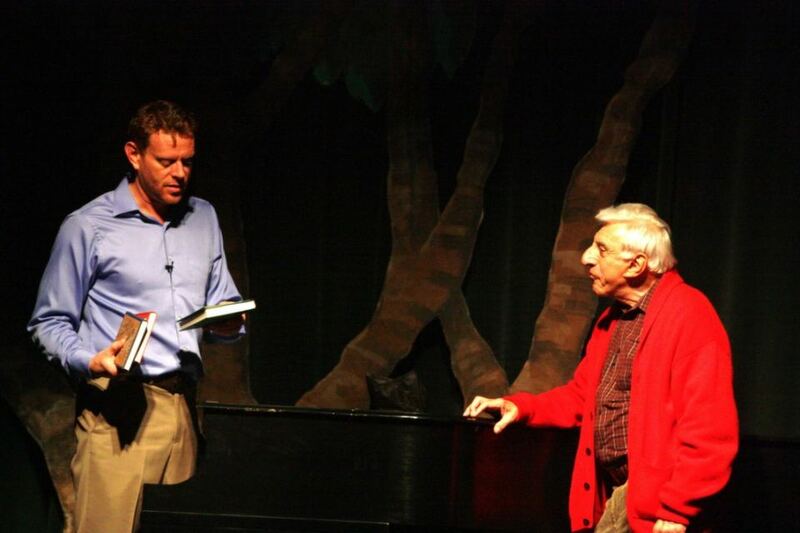 Anybody who knows Jamie Farr from his Hollywood Boulevard Star fame as Cpl. Klinger on “M*ASH” – and who doesn’t? – is in for a happy surprise. 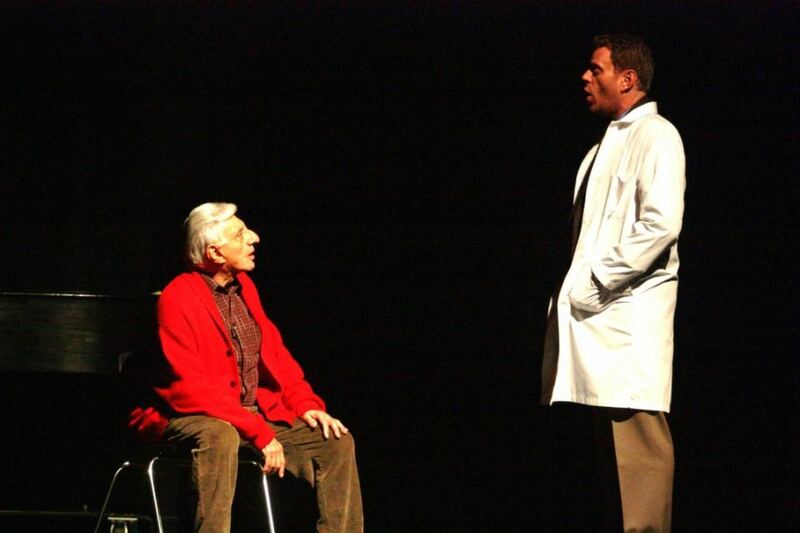 To see Farr live on stage is to see that rare event in the theater: an artist of stature at the top of his power. He’ll make you laugh – but you expect that. He’ll put a lump in your throat and bring a tear to your eye, and you can count on that, too. But more – much more – Farr makes you think, and look into your own heart, and come to life again. Farr and Canadian actor Réjean Cournoyer become two real people: author Mitch Albom and his college professor Morrie Schwartz. They play out 14 Tuesday visits the student made to his beloved teacher when they reunited 20 years after graduation. A chance reunion following a glimpse of his old professor on “Nightline” takes Mitch, and everybody in the audience along with him, into Morrie’s “master class in the meaning of life” even as his life is ending. 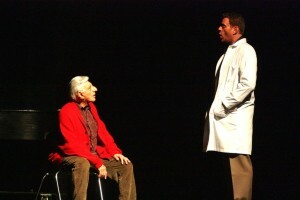 Albom first told the story in a best-seller, and then with Jeffrey Hatcher rewrote it as a play. 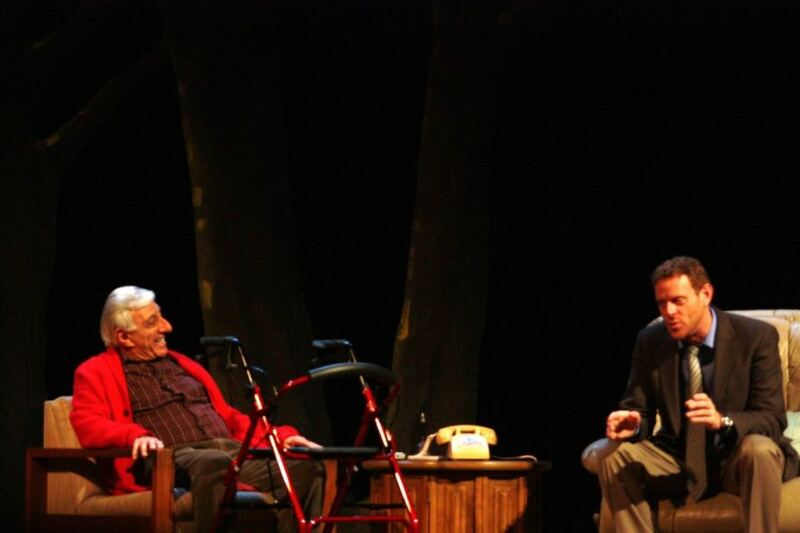 Morrie and Mitch could not be better realized than in this pairing. Farr and Cournoyer toured Canada and appeared off-Broadway before Sills persuaded them to come home with him to Southern Pines. As in last week’s “Love Letters” here are two more of the seasoned professional actors Sills means to bring to this market. Performing artists of this caliber playing live, on a local stage, bring the real theater here. This is a terrific show – never maudlin, never trite, and never ever dull. It is a breathtaking full-out professional evening in the theater – the kind of evening that changes the air itself, as only theater can. See it. You won’t forget it. Réjean Cournoyer (Mitch) is originally from Halifax, Nova Scotia and is happy to be making his JTC debut. Past stage credits include Sweeny in SWEENY TODD (Citadel Theatre; Sterling Nomination), Javert in LES MEISERABLES (Arts Club Theatre; Jessie Nomination), Beast in Disney’s BEAUTY AND THE BEAST (Citadel Theatre/Theatre Calgary), Mitch in TUESDAYS WITH MORRIE (4X City National tour), SAINT CARMEN OF THE MAIN AND THE NATIVITY: A COYOTE’S CHRISTMAS (National Arts Centre); Orin in LITTLE SHOP OF HORRORS (Canadian Stage), and PELAGIE (Canadian Stage, Dora Nomination). Selected film and TV credits include WEDDING MARCH, OCTOBER 1970, BABY, RIDEAU HALL and THE EVENT for which he won a 2003 ACTRA Award for Outstanding Male Performance. He holds a degree in Public Relations from Mount Saint Vincent University.